HomeServiceHow to earn money by copying our signal on MQL5? Form of payment: weekly or monthly fixed fee. Service commission: 30%, included in the subscription fee. Systems for a subscription payment: PayPal, Webmoney, Neteller, ePayments, plastic cards. Brokers providing MQL5 signals: Pepperstone, Roboforex, Axitrader, etc. Signals from MQL5 is a service/platform where you copy transactions of experienced traders. You should connect to provider’s signals and his transactions will be automatically reproduced on your account. You do not engage in trading but keep a wary eye (if you want) on the signals provider’s actions. If you feel that the provider is doing something wrong, you can disconnect from the signals. What do you need to know before subscribing to the MQL5 signals? How to subscribe to the signals from MQL5? To get started register on the MQL5 site. After subscribing your account is synchronized with the signal provider’s account. 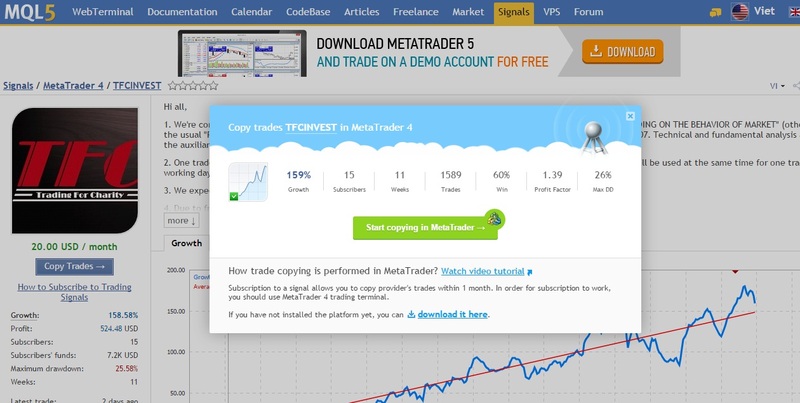 Now you have completed the SUBSCRIPTION process and the only thing you need is a VPS (Virtual Hosting) in order to copy the signal 24/7 without having your MT4 platform open all day long. The volume is multiplied by the ratio of provider and subscriber’s funds given currency deposit and permissible load on the deposit, considering currency of the deposit and the permitted load on the deposit which is specified in the platfrom settings. For example, you have 8000 EUR on your balance, the allowable load is 50%, the provider has 10 000 USD on his balance. The current rate of EURUSD is 1.30000. If the provider offers a deal with the volume of 1 lot, then the position with the volume of 0.52 lot is being opened in your account. Taking into account the allowable load, your balance is 4000 EUR or 5200 USD. Consequently, the volume ratio is 5 200/10 000 = 0.48. Then the leverages of provider and subscriber are compared. If the subscriber’s leverage is bigger than the provider’s leverage, the transaction volume will be the same on the provider and subscriber’s account. If it is smaller, the transaction volume varies in direct proportion to the ratio of the provider and subscriber’s leverages. Let’s assume, that the provider’s leverage is 1:100, yours is 1:500, while another subscriber’s one is 1:10. The provider opens the transaction with the volume of 1 lot. In the case of 100% copying and the deposits amount and currency are identical, the transaction with the volume of 1 lot will be opened on your account, while the second subscriber will have the order with the volume of 0.1 lot. You can’t set the transaction volume by yourself! The only disadvantage of the signals copying may be high risks. Forex is unpredictable, and the signal providers can be wrong despite the experience. Therefore, invest as much as you can afford to lose in the case of an unfavorable outcome. Can I copy tradings from MetaTrader 4 to MetaTrader 5, or vice versa? No, it is impossible. 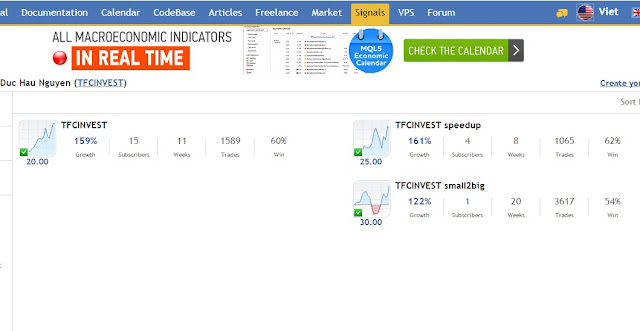 You can select the signal in the trading platform, where your account is registered. Alternatively, you can open the account in the platform, for which the signal is intended. How is money for the paid subscription deducted from the balance? What will happen if the free subscription becomes suddenly the paid one? When you subscribe to a signal the payment amount for the entire subscription period freezes on your balance. But it does not come directly to the provider’s account. The money will be deducted after the subscription ends. If for some reasons the provider cancels his signal transmitting, you get back your money. If the subscription was free, and then became paid, you won’t pay for it up to the end of your subscription term. After the subscription ending, if you want to extend the signals transmitting, you will be asked to pay for the further use of the subscription. I want all the transactions to be carried out with a fixed volume of 1.0 lot. Is it possible? No, the volume of transactions is calculated automatically by the terminal based on the specified settings, and the ratio of funds in the accounts of the Subscriber and the Provider. A fixed volume of transactions can not be specified by yourself. In case of any requirement of support, please do not hesitate to contact us. Thank you for joining us and happy trading!